Living the life of Riley: New Kongs! 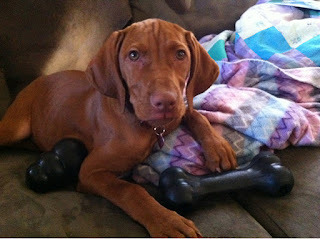 Riley was chewing so hard on her "puppy" Kong that she was biting small chunks out of it. Today she got 2 new "extreme" Kongs and she absolutely loves them! :) Her favorite treat is eating peanut butter out of her Kong and it keeps her entertained for a good hour or so.